My previous Devon Rex was dumped at a shelter after 18 months being locked in a room. She’d been bought on the misguided belief that she wouldn’t cause cat allergy. It took me years to get her settled after that rough start, and it could have been worse. I’ve seen plenty of animal lovers who are allergic to their pets. It’s heartbreaking to watch. The good news is there are things you can do to help. What Causes Cat & Dog Allergy? Importantly, the hair is not the allergen. Dog and cat allergens are produced mainly by the sebaceous glands in the skin, and a lesser amount by the salivary glands. It’s probably much the same in other pet species like rabbits, ferrets, rats & mice. These allergens are very small particles than can remain airborne for long periods, settle on surfaces and be stirred up by activity. They can remain in a house for six months after the presence of pets. Symptoms in people can range from upper respiratory signs like sneezing, nasal discharge and conjunctivitis, skin rashes, to asthma and breathing difficulties. Allergies to cats are at least three times as common as dog allergies. What Are The Hypoallergenic Dogs & Cats? Beware. Despite what you hear, there is no evidence that hypoallergenic breeds of dogs or cats exist. Studies show that so-called low allergy dogs shed as much allergen as regular breeds of dog, and in fact have higher levels in their coats. There is a lot of talk about which breeds are low allergy, but scientific evidence is lacking. The only thing you can do is see if you react! If you have your heart set on an animal that a house member is allergic to, there are some breeds considered likely to produce lower reactions. The allergic person should first be able to spend a lot of time with the animal in a contaminated environment (like the breeder’s house) without reacting. Don’t even consider this for life-threatening diseases like asthma. These breeds are available in Australia and considered to be low allergy. Until genetically modified dogs become available there is no such thing as a truly hypoallergenic dog. Choosing a smaller dog should reduce the amount of allergen. All of these breeds need frequent grooming. Cat allergies are harder to control or prevent. There is probably no cat breed that is low allergy enough to be able to live with people who have cat allergies. People with allergy to cats find that they react to some individuals more than others, but this can even be between two cats of the same breed. Important: If your child has allergies or asthma, unless they have a positive reaction to that animal, removing the pet is of no benefit. All too often we hear of generic advice to remove pets from allergy homes without checking what the reaction is to first. Consult your immunologist. Keeping a cat, dog or rabbit out of the bedroom and living room should improve symptoms. The last thing an allergic person needs is a cat sleeping on their pillow! Keeping rabbit, rat or ferret hutches in well-ventilated areas should help too. Asking a dog to live outside isn’t recommended for many breeds, but some may cope. Your cat can live safely outside in an enclosed run. Vacuuming has been shown to be of no benefit for pet allergy regardless of the level of filtration. That doesn’t mean don’t do it if it seems to help your situation. It may work better with dust mite allergies, for example. Hutches and pet bedding should be cleaned and aired in sunlight at least once a week. Especially with cat allergy, washing the hands straight after patting stops you transferring the allergen to your eyes. Changing clothes after handling a cat is also a good idea. High Efficiency Particulate Air (HEPA) filtration produces only modest improvements in allergy symptoms. The best results are from whole house filtration via high efficiency filters in a ducted system. Approximately 25% improvement has been achieved by the use of portable HEPA filtration units in the bedroom and living room. Ionic electrostatic cleaners and low efficiency filtration have no proven benefit. Even HEPA filtration is likely to do more harm than good if filters aren’t maintained properly. Dogs cleaned twice a week have a proven reduction in allergen load. Read how vets recommend dogs bathed here. Bathing is also likely to help with allergies to other pets but not to the same extent. Giving a pet a daily wipe down may help, but the effect is unproven. Keeping your dog groomed or your cat’s long hair trimmed is likely to be helpful as long as it’s done off-site and the pet is bathed afterwards. Mattresses and pillows should be fitted with covers designed to exclude allergens, and bedding cleaned weekly. Throws can be used for lounge chairs. It’s a fair bet that houses with smooth floors contain less allergen but as it’s the airborne component that really matters, it may not make much difference. These do work well for some people; it’s a matter of finding which one works best for you. The first thing recommended by allergists and immunologists is the last thing we want to do. Sometimes it’s the only option, especially where lives are at stake. 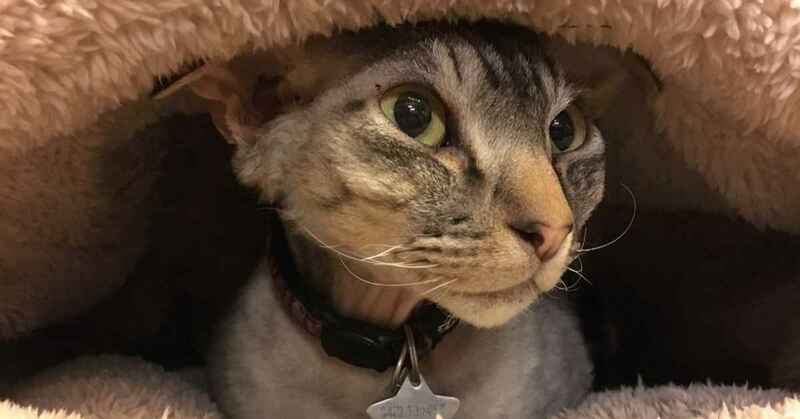 If my Devon Rex was returned to the breeder without much delay, she wouldn’t have suffered the deprivations she experienced. Immune systems are adaptive and can learn to ignore pet allergens if trained. Prevention of pet allergy has been documented by very early exposure to the animal. Babies raised with cats, for example, are less likely to become allergic to them. Treatment of pet allergy is also possible. Ask your GP about the options and referrals available in your area. Hesselmar B, Aberg N, Aberg B, et al. Does early exposure to cat or dog protect against later allergy development?. Clin Exp Allergy. 1999 May. 29(5):611-7. Hodson T, Custovic A, Simpson A, et al. Washing the dog reduces dog allergen levels, but the dog needs to be washed twice a week. J Allergy Clin Immunol. 1999 Apr. 103(4):581-5. Mandhane PJ, Sears MR, Poulton R, Greene JM, Lou WY, Taylor DR. Cats and dogs and the risk of atopy in childhood and adulthood. J Allergy Clin Immunol. 2009 Oct. 124(4):745-50.e4. Nicholas CE, Wegienka GR, Havstad SL, Zoratti EM, Ownby DR, Johnson CC. Dog allergen levels in homes with hypoallergenic compared with nonhypoallergenic dogs. Am J Rhinol Allergy. 2011 Jul-Aug. 25(4):252-6. Sublett JL. Effectiveness of air filters and air cleaners in allergic respiratory diseases: a review of the recent literature. Current allergy and asthma reports. 2011 Oct 1;11(5):395-402. Vredegoor DW, Willemse T, Chapman MD, Heederik DJ, Krop EJ. Can f 1 levels in hair and homes of different dog breeds: Lack of evidence to describe any dog breed as hypoallergenic. J Allergy Clin Immunol. 2012 Oct. 130(4):904-909.e7. By Andrew Spanner BVSc(Hons) MVetStud, a vet in Adelaide, Australia. These blogs are from a series regularly posted on Facebook and Twitter. We do not accept payments or incentives in return for stories. Like or follow our page or subscribe via email to read the latest. Next PostNext Is Breeding Bigger Better?